Whether you’re a homeowner looking to make your home green, or a REALTOR® trying to market your listings as eco-friendly, the energy efficiency ratio (EER) is an important part of your home energy audit. But what exactly is an EER? In short, it’s a way to determine how efficiently your home’s HVAC system operates. The higher your EER, the more efficient the system, which means you’re spending less on operating costs and maintaining a consistent and comfortable temperature in your home year-round. How Do You Calculate Your Energy Efficiency Ratio (EER)? A unit’s energy efficiency ratio is the ratio of cooling energy to the amount of energy (wattage) required to power your unity. Cooling energy is always measured in British thermal units (BTU) and represents the amount of energy needed to raise the temperature of 1 pound of water 1 degree Fahrenheit. For air conditioners, this means how much BTUs the unit can remove from the air around it, thus cooling a space. You can find the EER of any air conditioner as long as you know its BTU and wattage values, which are usually provided by the manufacturer. Generally, an EER of 12 or above is considered energy efficient, however, when comparing two models, the one with the higher EER is more energy efficient regardless of whether or not it is above 12. It’s important to note that as a baseline, the EER is calculated using 95°F as the outdoor temperature, 80°F as the indoor temperature, and 50 percent as the relative humidity. The actual, operating efficiency of the unit on a day-to-day basis depends on weather fluctuations, your climate, and the conditions inside your house. A higher difference between indoor and outdoor temperature leads to less operating efficiency. What’s a SEER (Seasonal Energy Efficiency Ratio)? If you’ve heard of EER, you might have also seen the word SEER. Seasonal Energy Efficiency Ratio (SEER) is a similar ratio of the cooling energy to the electric input energy, but only takes into account seasonal use rather than year-round use. This is ideal for purchasing HVAC units in countries with strong seasonal changes, for instance, in any climate where you only run air conditioning in the summer. Again, the higher rating is always more efficient, so aim as high as you can. Most central HVAC units use SEER ratings, while portable air conditioners and window HVAC units use EER. Most homeowners are used to buying HVAC units by the BTU rating, but the problem is that the BTU rating alone doesn’t determine energy efficiency, or even operating efficiency. You can have a 12,000 BTU unit that operates on 1,400 watts, which is an EER of 8.5, or the same 12,000 BTUs operating on 800 watts, which works out to an EER of 15: nearly twice as efficient. As you can see, there are many reasons why it’s important to consider the EER instead of the BTU when shopping for a new unit. Not sure where to find high-EER HVAC systems? It helps to buy from the ENERGY STAR® catalog, as every listed HVAC unit needs to meet certain standards for EER and SEER. In fact, these air conditioners use approximately 10% less energy than standard models and can save you around $70 per year. Look out for the ENERGY STAR® logo on any unit you’re considering buying. You can see each unit’s EER and SEER on its Energy Guide Label, which provides an overview of the information you need to determine whether or not a unit is energy efficient. This will make it easier for you to compare two models to find the one that is right for your home. Should You Pay More For A Higher EER Rating? Price plays an important role in the decision-making process when shopping for a new HVAC unit. Many people want to spend as little as possible on a new unit, which is completely understandable, but price is not the only factor that should be considered when making this decision. It’s important to understand how to determine if it’s worth spending a bit more in order to buy a unit with a higher EER rating. For example, let’s say you are deciding between two 10,000 BTU HVAC units. The first has 1,200 watts of power input, giving it an EER of 8.3, whereas the second has 1,000 watts of power input, giving it an EER of 10. The second has a higher EER, which means it is more energy efficient, but it also costs $100 more than the first. Is it worth spending another $100 in order to get a more energy efficient unit for your home? 5 months x 30 days per month x 8 hours per day = 1200. You also discover that your utility provider charges $0.10 per kWh. Now, how can you use this information to determine if you should pay more for the energy efficient unit? The difference in energy consumption between the two units in question is 200 watts. This means the less expensive unit, which consumes 1,200 watts, will consume an extra kWh every five hours that the unit is running. Your utility provider charges $0.10 for each kWh, so if you are running the unit for 1200 hours, you will incur an additional $24.00 in utility expenses every year with the less expensive unit. In a little over four years, you will have incurred roughly $100 in additional expenses simply because you chose the less expensive unit. In this example, the difference in price between the two units would have been covered after four years of using the more expensive unit. Although you are saving money upfront by choosing the cheaper option, you are spending more long-term on a less efficient unit. Keep this in mind when figuring out which unit to buy for your home. Understanding your HVAC system’s energy efficiency ratio is the first step toward serious savings on your utility bill and minimizing your carbon footprint. But, choosing a unit with a high EER is not the only way to maximize your HVAC’s energy efficiency. If you want to stay cool inside your home, there’s no need to dial the temperature on your thermostat down too far. 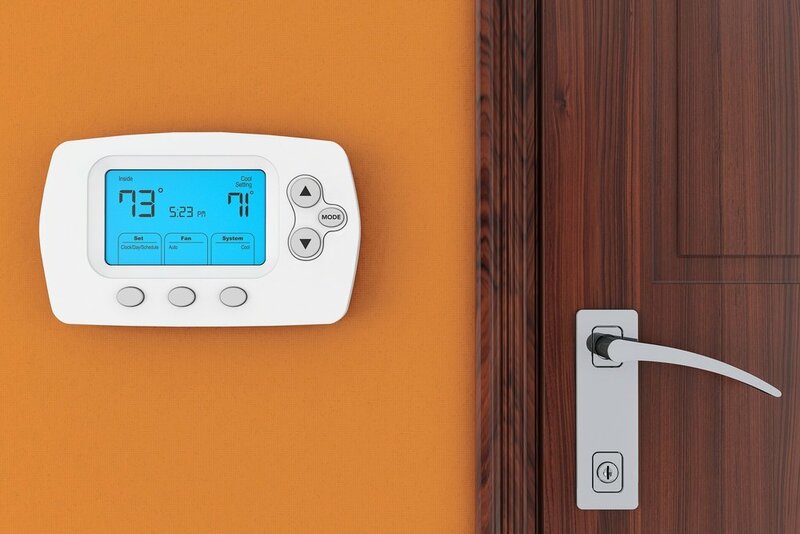 Keeping your thermostat set at 78 degrees Fahrenheit will keep your home cool without wasting too much energy. You should also learn to rely on ceiling fans to reduce the temperature in the room. Using a ceiling fan allows you to turn the temperature on the thermostat up by 4 degrees Fahrenheit without sacrificing your comfort. It’s also wise to install a programmable thermostat in your home. Use this tool to preset your home’s heating and cooling schedule. For example, set the thermostat to automatically turn off during the hours you are at work every day so the HVAC does not waste energy on maintaining a comfortable temperature inside an empty home. Using a programmable thermostat to set your heating and cooling schedule can ensure you will not forget to turn off the unit before leaving home or going to sleep. Keep appliances and devices such as lamps, televisions, and computers away from your thermostat. These items tend to emit heat when they are in use, so the thermostat could sense the heat coming off of them and assume that the room needs to be cooled down. This can lead to your air conditioner running around the clock, which will cause a dramatic spike in your energy usage and utility bills. Finally, make sure you schedule regular HVAC inspections with professional technicians. A technician can carefully examine the unit and identify issues that could affect its energy efficiency. If these issues are caught early on, they can be repaired before they have an impact on the unit’s energy consumption. Take the time to make smart decisions about your home cooling system today. Following these tips can help homeowners choose the right HVAC unit for their home and reduce their utility bills. A home energy audit is the next step to reducing your carbon footprint even further!